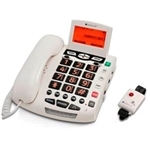 For Corded Phone Users who prefer the landline style telephone, adaptive systems offer a range of helpful features from increased volume control to flashing ringers and larger buttons. On sale now: $10.00 Off ClearSounds CSC600ER UltraClear Amplifying Emergency Connect Speakerphone. Conference-grade speakerphone delivers crisp acoustic sound. Digitally adjusts frequency-specific volume levels so that any user can comfortably and clearly hear a caller's voice. Audiologist's Choice Telephone Comfort Ear Pads for handset phones are designed for individuals with hearing disabilities. Geemarc AMPLI550 Amplified Speakerphone with talking caller ID. 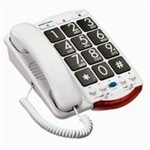 This assisted listening corded phone has up to 50dB amplification. extra large backlit LCD display and tons of adaptive features. Amplicom PowerTel 760 with integrated answering machine. Big button phone amplifies 53 dB, for mild, moderate and severe hearing loss. You can set up individual volume and tone preferences for members of the household. Clarity Alto Extra Loud Big Button Speakerphone, ideal solution for mild, moderate and severe hearing loss. The ergonomic volume and tone control is also perfect for those with arthritis. with amplification up to 53 dB and extra loud ring volume. CSC600ER includes wireless pendant for emergencies. All the great features of an amplified speakerphone PLUS emergency pendant sends wireless signal to dial your emergency contact. Adaptive corded phones such as amplified telephones like the Clarity JV35 that have adjustable volumes so the listen can find the decibel level best for them. They can be used with or without a hearing aid, for those who do wear hearing aids, some can filter out buzzy feedback with a special compatibility feature. To accommodate the degree of hearing loss of the user, phone choices come in a variety of optimum loudness level. Other features you can look for is tone control tuned to the caller’s voice.